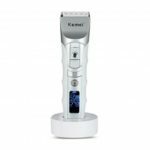 This KM-PG102 Hair Clipper features unique headlight design, convenient to use in the dark. 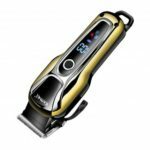 With LCD display, easily control the time between haircut and recharge. 4 adjustable limit comb to meet your different requirement. 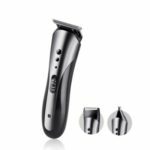 It will provide excellent cutting performance for you. Equipped with head light, can help you work in dark condition. 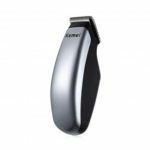 Intelligent LCD screen can display electricity accurately, make you easily control the time between haircut and recharge. Come with 4 adjustable combs (3/6/9/12mm), offer more options and convenience in use. High efficient 30 degree acute angle blade can maintain a long time sharpness. 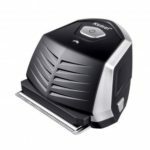 Cutting hair more accurately and efficiently. Built-in 800mAh Li-ion battery ensures 90 minutes super long working time after 2 hours fast charge. Suitable for professional use. When your hair get stuck, the machine will stop working immediately to protect your hair. Can be charged with adapter and USB power source. You can freely cut your hair at any time anywhere.